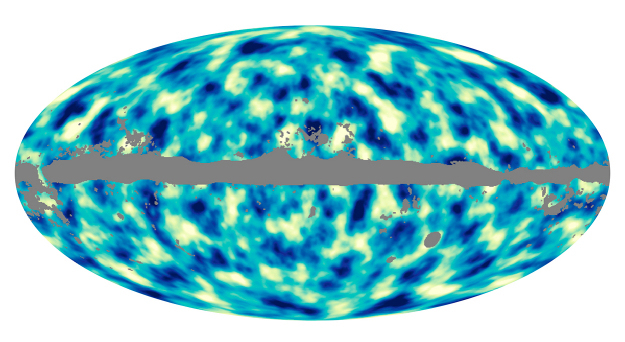 This all-sky image shows the distribution of dark matter across the entire history of the Universe as seen projected on the sky. It is based on data collected with ESA's Planck satellite during its first 15.5 months of observations. Dark blue areas represent regions that are denser than the surroundings, and bright areas represent less dense regions. The grey portions of the image correspond to patches of the sky where foreground emission, mainly from the Milky Way but also from nearby galaxies, is too bright, preventing cosmologists from fully exploiting the data in those areas. The image was compiled by analysing the tiny distortions imprinted on the photons of the Cosmic Microwave Background (CMB) by the gravitational lensing effect of massive cosmic structures. As photons travelled through these structures, which consist primarily of dark matter, their paths were bent, slightly changing the pattern of the CMB. The reconstruction technique used to compile this image relies on deviations of the shapes of hot and cold spots in the CMB from their 'typical' shape, and it is impossible to avoid the introduction of statistical 'noise' in the reconstruction; approximately half of the modes in this image are due to this noise. 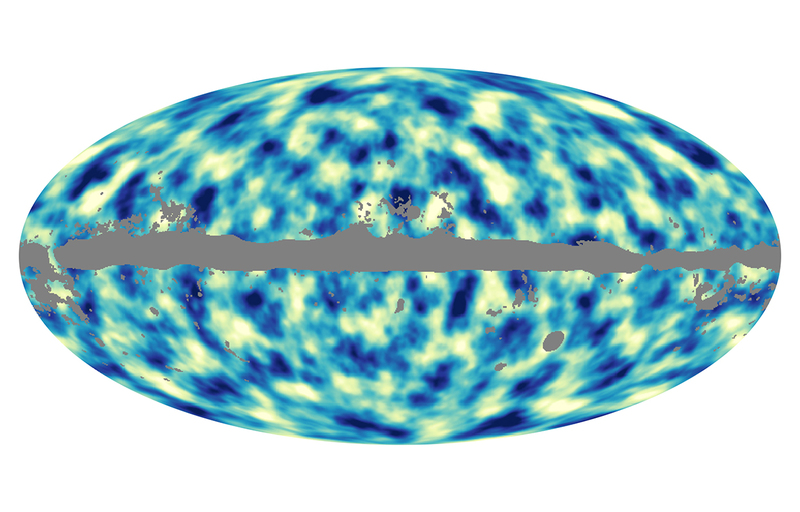 This image is the first measurement performed over almost the entire sky of the gravitational potential that distorts the CMB, and is one of the highlights of Planck's cosmological results. With these unique data, cosmologists can investigate 13 billion years of the formation of structure in the Universe. The data agree very well with the expectations from the leading cosmological model that describes the origin and evolution of cosmic structure in the Universe.